This beautiful space measures 9 x 12m with 6m ceilings. It features a baby grand piano on a polished wooden floor, an upstairs viewing gallery, and is bathed in natural sunlight from the north-facing windows. The windows have venetian blinds and heavy black drapes. A music system is also available. 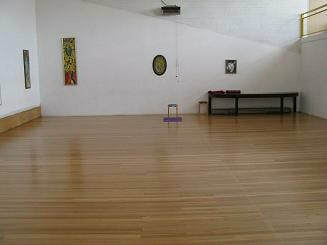 This space is ideal for large classes in movement, dance, yoga or theatre rehearsals. Some yoga equipment is available by negotiation. Clean toilets and a well-equipped kitchenette are across the hallway. 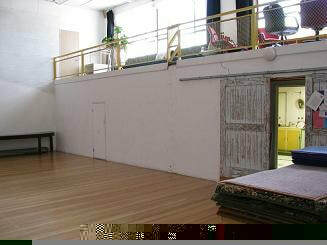 Casual hire rates are $30 an hour for the large studio. For available times see the Large studio calendar. 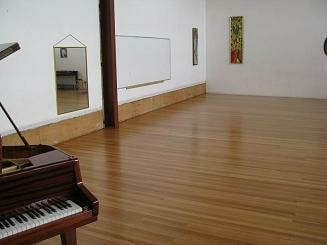 All enquiries re studio hire or to make a booking contact John Howard 0430120436 or use the email form below.